New Delhi, December 4: The government has made it mandatory to link Bank Accounts, PAN, Mobile numbers, insurance policies and social schemes to Aadhaar to bring transparency in the economy. 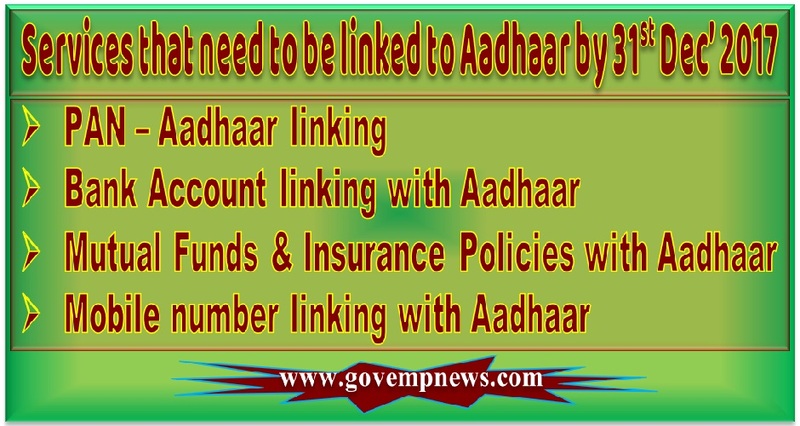 The government is expanding scope of Aadhaar linkage to more essentials. Furnishing of 12-digit unique Aadhaar number for opening new bank accounts and to avail social schemes has also become mandatory. The 12-digit unique identification number has become one of the most important documents to have as it has become mandatory to avail essential services. The deadline to link PAN to Aadhaar is December 31, 2017. If you have still now linked the two documents, visit the Income Tax website, enter your PAN and Aadhaar details, and complete the authentication process to avoid last minute hassle. The government has made the PAN-Aadhaar linking mandatory for filing ITR (Income Tax Return) and obtaining a new Permanent Account Number (PAN) from July 1. Visit www.incometaxindiaefiling.gov.in and click on ‘Link Aadhaar’ option that is on the left side of the website. Enter PAN (User ID), password and your date of birth. Now click on ‘Profile Settings’ tab and select the last option ‘Link Aadhaar’. You are required to enter details like name, date of birth and gender as per PAN records and also your Aadhaar number. The deadline to link bank services with Aadhaar is December 31, 2017. An individual can link the details to Aadhaar by visiting the branch or by mobile banking. In case if you wish to do it via the internet, log in to your online banking account and click on the ‘Update Aadhaar’ link. Enter your Aadhaar details and submit it. Use the OTP sent to your registered number to complete the process. The government had said that if you fail to link the two, you bank account will be invalidated. The deadline to link Mutual Funds and Insurance Policies with Aadhaar is December 31, 2017. Failure to do so, the mutual fund account will cease to be operational while your Insurance Policies will become inaccessible. If you still haven’t linked the mutual fund details with Aadhaar, CAMS and Karvy Computershare offer an online facility for linking your Aadhaar to your mutual fund account. Meanwhile, to link your insurance policies with Aadhaar, you can log in on to the website or visiting the customer service department of your insurance provider. You will only require providing your policy number and date of birth for the verification. Once verified, you will be asked to update your Aadhaar number. Currently, only LIC, SBI Life Insurance, ICICI Prudential Life Insurance and Max Life Insurance offer online Aadhaar linking services. The government directive has made it mandatory to link Aadhaar with SIM Cards by February 6, 2018. Customers need to start the process of linking their Aadhaar card numbers with phone numbers, failure to do so which lead to disconnection of services. To link the documents, you need to visit a store or service centre of your mobile service provider or call their customer service to request Aadhaar linking. 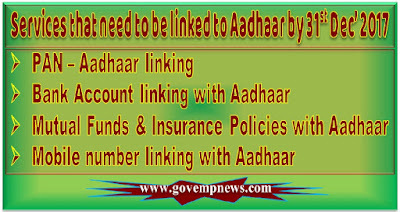 The liking of Aadhaar with SIM is being done as per the orders of Supreme Court passed in February this year in Lokniti foundation case and all SIM cards have to be verified with Aadhaar within a year from the date of judgement, with all unlinked phones to be deactivated after February next year, so criminals, fraudsters and terrorists cannot use the issued SIMs. Prime Minister Narendra Modi earlier this week noted that Aadhaar is helping in bringing about an “irreversible change” in the interest of the people. He said the Unique Identification Number will work as a “big weapon” in the fight against benami property too. Reports suggest that over 13.28 crore Permanent Account Numbers (PANs) have been linked with the Aadhaar till now. The UIDAI has also rolled out an easy method by which users can link their Aadhaar to their mobile numbers without visiting the local SIM card retailer. Starting December 1, users can link the two at their own comfort through OTP received on the mobile number registered with Aadhaar.